America's Cup - Official site. Also see YouTube America's Cup. Barelona World Race - The fastest sailing ships in the world leave Barcelona, Spain, to sail a full loop around the Earth, West to East and via the Three Great Capes - Good Hope, Leeuwin and Horn. Caribbean Ocean Racing Triangle (CORT) - Warm water, constant trade winds, top-notch competition and great shore side parties and activities make the best racing series in the Caribbean. Clipper - The only race in the world where the organisers supply the fleet of twelve identical, 70-foot, stripped down racing yachts - each sponsored by a brand - and manned with a fully-qualified skipper, employed to lead the crews safely around the globe. Cruising Yacht Club of Australia - Australia's premier ocean racing club for conducting world class events such as the Telstra Sydney to Hobart Yacht Race, and Southern Cross Cup, and for setting the benchmark for ocean racing excellence. CupInfo - All about the America's Cup. Fairplay Cup - An annual sailing event which gets representatives of the different sectors of the shipping industry together in a friendly but mildly competitive environment. For more information visit this site. Formula 1 Powerboat World Championship/F1H20 U.I.M. World Championship - Official site. Governor's Cup - Cape Town to St. Helena Island, 1690 nautical miles. London Grand Prix Championships - Honda Formula 4 stroke championship. NOOD Regattas San Francisco - Sailing World's coverage of the San Francisco NOOD Regatta, performance sailing racing coverage with photos, videos and finals. Rolex Big Boat Series - Annually attracts many world-caliber sailors, all of whom are eager to win one of the six specially engraved Rolex timepieces, given to the winners of San Francisco's St. Francis Yacht Club's Perpetual Trophies. Royal Ocean Racing Club (RORC) - The club racing is now on a two-year cycle with the Fastnet and the qualifiers necessary for it in each odd numbered year. 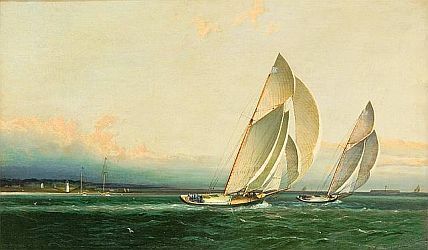 For a typical "even year" such as 2004 there was a revival of a race from the Solent to Cascais in Portugal, and a series in the Solent and offshore for three boat teams from around Britain and abroad for the Rolex Commodores' Cup. Some 20 events appeared on the annual programme, climaxed by the RORC racing division of the ARC race from Las Palmas, Canary Islands, to Rodney Bay, St Lucia. In the Mediterranean there was the Middle Sea race of 630 miles from Malta, the China Sea race of 650 miles was from Hong Kong to Manila and there was a non-stop 700-mile round Ireland event. Continental ports which marked the finish of races of various lengths included St Malo, Ostend, Scheveningen, Cherbourg, Le Havre, Dieppe and St Quay Portrieux. Multihulls, having been given a class briefly in the 1960s, were re-admitted in 1997 and then seemed set to continue. Royal Sydney Hobart Yacht Race - Conducted on the waters of Sydney Harbour, the Tasman Sea, Storm Bay and the Derwent River. San Francisco Yacht Club - Regatta and cruising schedules. SDsailing - San Diego racing site. SEAFAIR - Hydroplane races at Seattle's traditional summer festival. Storm Trysail Club - The Storm Trysail Club, in conjunction with its Southern, Chesapeake Bay, Great Lakes, New England and Gulf Coast Station run many major yachting events through out the year. Vancouver Area Racing Council (VARC) - VARC organizes Vancouver area yacht clubs that host keelboat races. Vic-Maui International Yacht Race - A sailing race from Victoria, British Columbia to Maui, Hawaii. Hosted by the Royal Vancouver Yacht Club and the Lahaina Yacht Club. Volvo Ocean Race - Famous Whitbead global race. World Cruising Club - Specialises in organising cruising rallies and races for yachts on a worldwide basis. Best known among the events, is the ARC - the Atlantic Rally for Cruisers, an annual rally for cruising yachts. Yachting Events - From Superyacht Times. This webpage last updated on Wednesday, January 6, 2016 2:16 PM.